I'm working on Haunted South Alabama and the sequel to Circe this week so I will be blogging slowly. 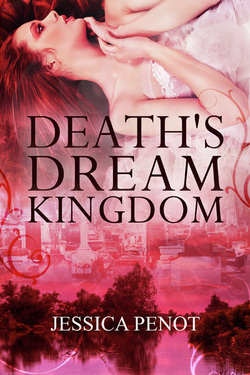 I hate to leave my blog completely naked while I work so until I get my lazy rear end blogging again, I'm going to give away free copies of my urban fantasy novel, Death's Dream Kingdom on Kindle. If you would like a copy, just email me your email address at jessica.penot@gmail.com. Cera is an ordinary wife and mother who enjoys the simple things in life, until the night she is murdered. In death, Cera finds herself trapped in a shadow land somewhere between the land of the living and the land of the dead, where demons, ghosts, and old gods roam the streets preying on the living. It is up to Cera to find out why the line between the living and the dead is fading and how the rift between worlds can be mended. Pulled into a quest that takes her to hell and back and into the arms of an ancient, demon lover, she finds that she is a child of the Fates and that she alone can challenge death himself for dominion over his kingdom. Thanks! I'd love to send you a copy if you are interested! I just wrote for an ecopy of Death's Dream Kingdom...I can hardly wait to get it! Thanks Patsy! I hope you enjoy it. I'm sending you a copy now.